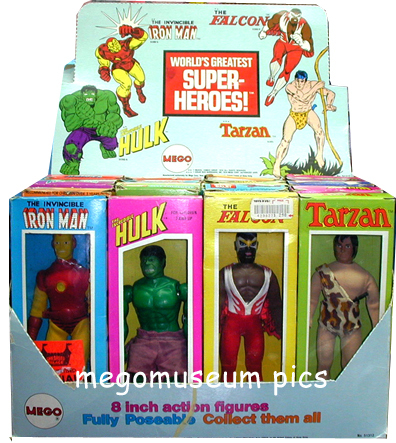 Ironman was released in a 1975 wave with Hulk, Tarzan and Falcon in their own store counter display box, very few of which survived. 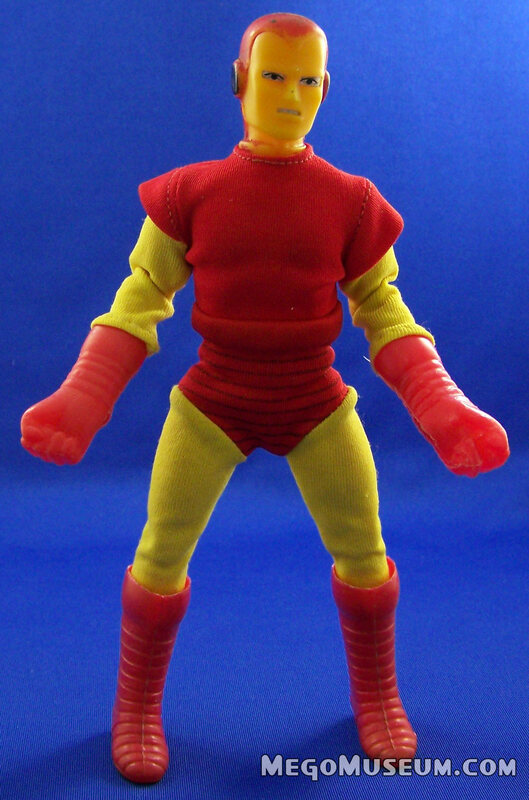 As with much of the 1975 WGSH releases, Iron Man was truly a benchmark of quality for Mego. 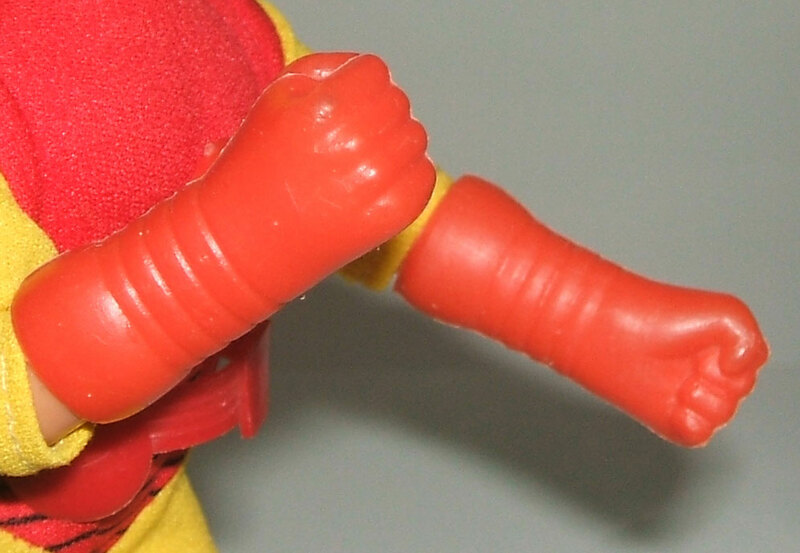 The figure was a serious attempt to capture the characters likeness and added creative details such as “fist” gloves and a sewn on chest piece. 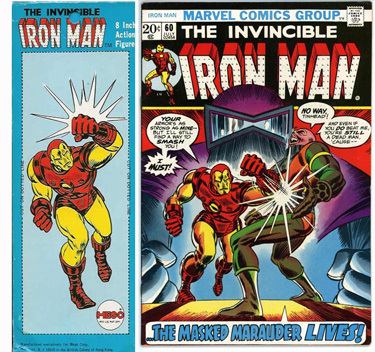 There is some question as to why the character has a nose, but many comic fans will point out for a brief point in the seventies, Iron Man did have a nose in the comics. The figure itself came briefly on a Type-1 body, although it is much easier to find on a Type-2. 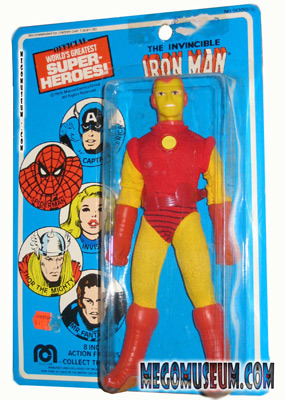 Due to the number of extras, a loose, mint complete Iron Man is not commonly found. 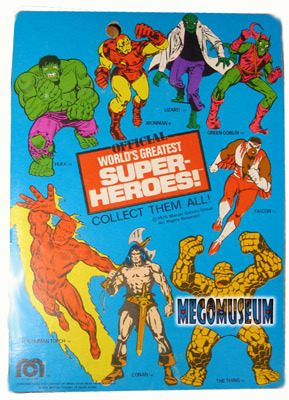 Iron Man had a shorter than average run with the WGSH, getting in on the action in the 1975 WGSH assortment he was summarily dropped after 1978 so he is almost impossible to find on a regular card. There is no Kresge Card for Iron Man. Iron Man is most commonly found boxed, but the packaging is pretty stellar. 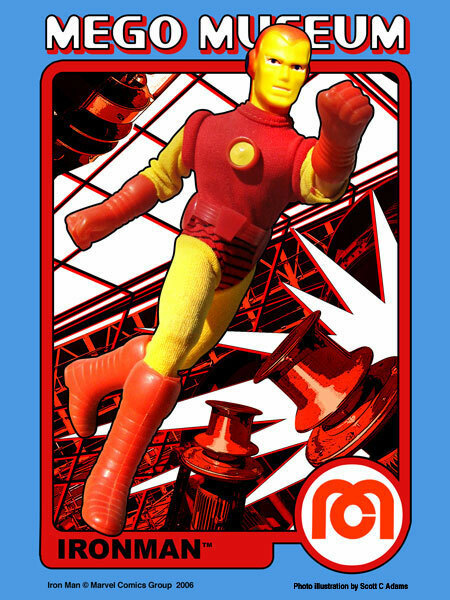 Iron Man Box Art (Iron Man July 1973) Slightly altered but nonetheless, it’s Mego Iron Man in a classic pose. 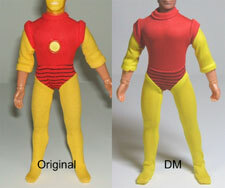 See more Mego Comic Book Origins. Iron Man is one of the most difficult of “World’s Greatest Superheroes” to find carded and easily rests in the top 3 rarest Superhero cards. He was only released in one carded assortment and was dropped afterwards. The above example is graciously provided by Mike J. On Ironman’s chest is basically a red button. It’s sewn on just like a button anyway. It has a round yellow sticker inside. 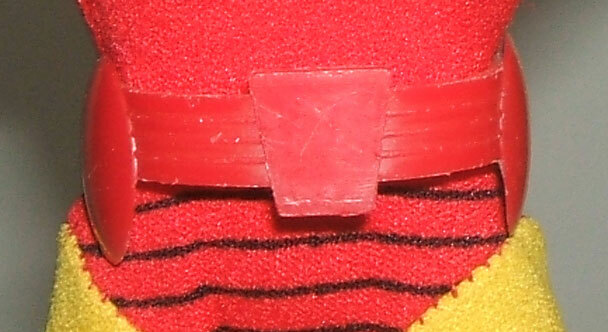 Ironman’s button hasn’t been factory reproduced, but often you will find homemade stickers in place of the original. The original is factory cut and perfectly round. It has a gloss finish. 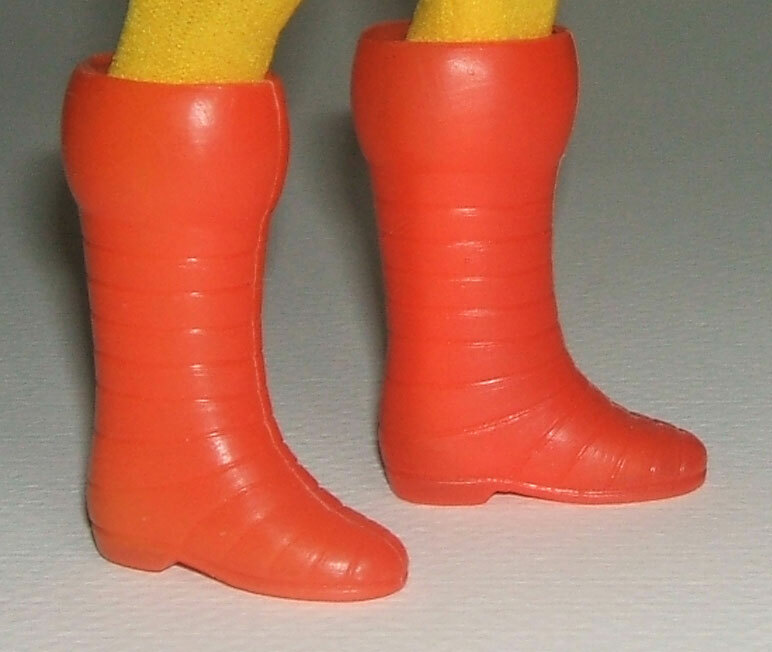 Ironman’s boots are unique to the character and have not been factory reproduced. They can vary in color, probably due to age and fade. Ironman’s gloves are also unique to the character and have not been factory reproduced. Like the boots, they can vary in color, probably due to age and fade. Another unique item and not factory reproduced. Ironman’s suit has been factory reproduced by Doctor Mego, and pretty accurately. The yellow is a little brighter, and the material is a bit slicker. The sleeves are a tad longer, and the collar a bit different. It is marked DMLOGO on the back inside seam.